Barcelona star Lionel Messi will be out for seven to eight weeks after tearing a ligament in his left knee during a 2-1 win over Las Palmas on saturday. 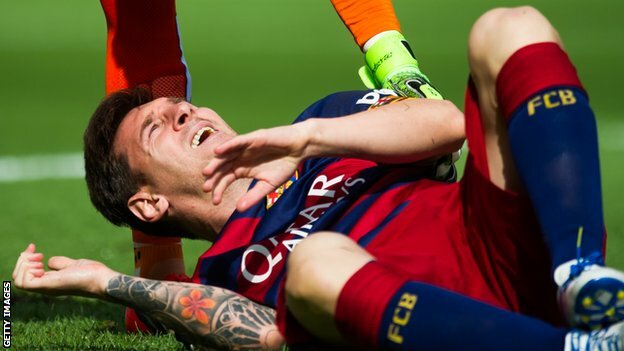 Messi, 28, was injured in the third minute of the match and was taken to hospital after being replaced. He may miss eight fixtures, but could return in time to face Real Madrid on 22 November. "I'm always sad when one of my players gets injured and even more when it's Messi," coach Luis Enrique said. "We will not change our style of play without Messi, although there are many moments in games in which Messi liberates us and finds solutions for us, so we'll have to strengthen in other areas and the team will have to step up without him." In Messi's absence, Luis Suarez scored twice as the champions beat Las Palmas to briefly return to the top of La Liga. Real Madrid failed to overtake the Catalan side when they could only draw against struggling Malaga at the Bernabeu, allowing Villarreal to climb above both teams with a 1-0 home win against 2014 champions Atletico Madrid. Former Liverpool striker Suarez rose superbly to head in Sergi Roberto's cross and doubled the lead when he powerfully converted at the far post following Sergio Busquets's dummy. Las Palmas forward Jonathan Viera reduced the deficit with a late strike, but Barca held on.